Kathakali | Where Is Annie? Just before we arrived in the southern Indian state of Kerala I finished reading the book The God of Small Things. From this story I learned about Kathakali, a form of dance-drama based on the ancient Indian stories of Rama and Krishna. In the past the plays lasted all night, but to draw more visitors including Westerners, the performances now last two to three hours in the evening. 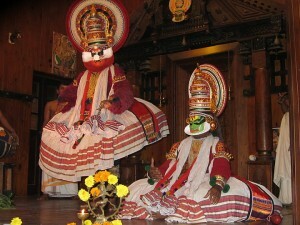 In the book some Kathakali players rush to the temple after their abbreviated performance to ask forgiveness from the gods for bastardizing the ritual for tourists. In a drunken state they try to appease the gods. For some reason that scene really stuck with me. When I saw the poster for a Kathakali performance I had to go. In an old part of the city of Kochi, we wound our way down a path, past a store and a restaurant to the small, wooden theater. Fire buckets lines the edge of the stage. This made me wonder what was going to happen during the show. I looked for the exits. I calmed as the evening began tamely. We watched while the players put on their makeup, a performance in its own right. An actor showed us how they made the makeup. He took a red rock and ground it against another rock. He then mixed the powder with coconut oil into a paste, and red pain appeared. A yellow rock was used for yellow paint. The green paint was made from indigo leaves and the yellow rock powder mixed together. The players slowly, carefully applied it with a stick. Each of the colors had meaning, the red for evil character, the green for the hero. Beards and whiskers were paper cut outs applied with a vegetable glue. The actor laid on his back as another artist sat crosslegged at his head. The artist painstakingly glued the multi-layered paper beard onto the actor’s face. To make red, angry eyes, the actor playing the evil beast placed a seed in his eyes for several minutes which stained his eyeballs. The whole process took over an hour. 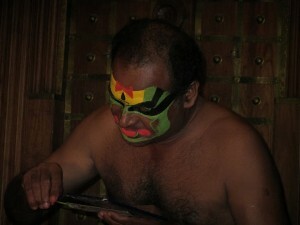 Next a player came out to explain the method of acting in the Kathakali. In addition to the actors there were drummers and a singer telling the story. All of these performers had spent years in schooling to learn their craft. The actors at least six years, the drummers at least three, the singers four years. During the school years the actors learned to perfect the use of their hands, eye muscles, and facial muscles to tell the story. There was no dialogue between the actors. He showed us the power he had over his eye muscles. The rapidity with which he could move his eyes back and forth or up and down was astounding. He demonstrated such agility with his forehead, his cheeks and his mouth as well. He also demonstrated hand gestures and dance steps each of which had a particular meaning. 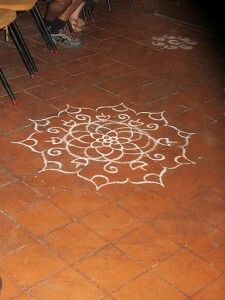 The theater was decorated with chalk mandalas. The stage was set with multiple candles (the fire danger?) and marigolds, no other props. The play began with the drummers drumming and the singer singing the story in Malayalam. There are 22 official languages in India. Malayalam is one of them. Spelled backwards: malayalaM. There is little to no Hindi spoken in Kerala. Hindi and Roman scripts are on a few street signs along with Malayalam, so that everyone can find their way. Otherwise it’s just Malayalam in Kerala. Of course, it didn’t matter what language the play was in. It was told with facial expressions, hand gestures, and dance steps. We had also been given a written summary of the section of the Mahabharata to be performed, the “Baka Vadham” or “The Killing of Baka”. The prince (in green face), Bhima, had been summoned by a villager, Brahmin (yellow face), because an evil, murderous forest-dwelling demon (red face), Baka, who was had taken control of the village. The first act involved Bhima and Brahmin discussing the scourge of Baka and Bhima’s promise to kill the beast. The second act involved Bhima killing Baka. It was the best death scene ever. Bhima stabbed Baka with his knife. The knife was held in place for a few seconds then turned. The evil beast was the only one to use his voice, making ugly cries and grunts. Each time the knife turned a new grunt/groan filled the theater. Baka fell toward the floor, gave his final grunt. It was time for the final curtain. The curtain was a blanket held up by two men in front of the actors. It was, after all, a small theater. And thankfully, there were no tricks with fire; the fire buckets were never needed. I thoroughly enjoyed the performance. We wouldn’t have seen the performance had I not read the book. We were there only three hours, but it was long enough. I know I could never have sat through an eight or nine hour performance overnight. I appreciate the actors giving up their principles and showing us a shortened version. I hope they didn’t feel the need to run to the temple and appease the gods afterward.